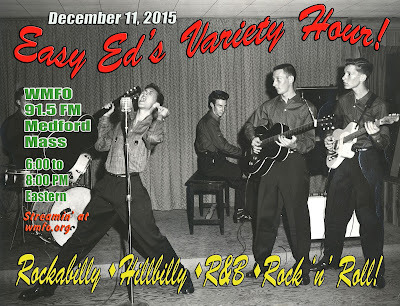 The December 11 Edition of "Easy Ed's Variety Hour"
Listed below are the songs played on last night's show--our last program of 2018. We want to thank all of our loyal listeners for tuning in throughout 2015. The show will be back in early January. Happy Holidays, all! 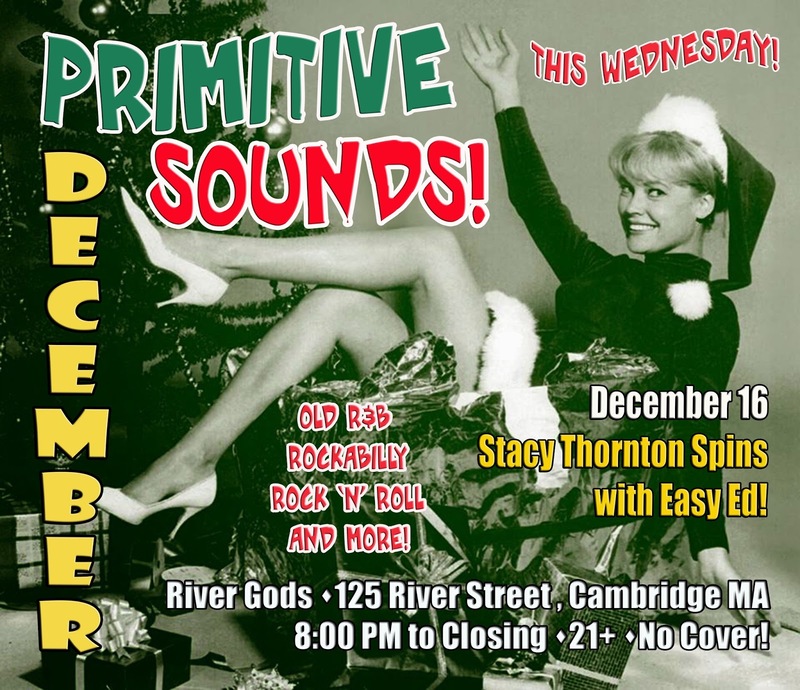 Our Primitive Sounds DJ night on December 16: This coming Wednesday I’ll be spinning the Primitive Sounds at River Gods along with special guest DJ Stacy Thornton. Stacy spins gems a plenty, in particular lots of great female R&B tracks from the 50s and 60s. This will be a really fun night—our last Primitive Sounds of 2015! The records spin from 8:00 ‘til closing. 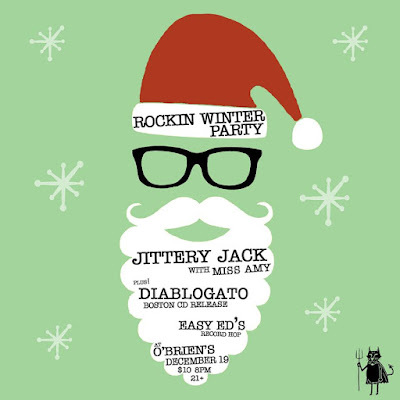 On December 19 we’ve got a huge rockin’ show planned at O'Brien's with Jittery Jack, Diablogato, and Easy Ed’s Record Hop. See the Facebook event link for details and advance ticket info! Various: Hey DJ! Play Some Jivers! Specialty Records 1956 (originally unissued). Little Richard celebrated his 83 birthday on December 5. Hi, folks. As I may have mentioned before, I cohost a longstanding, live record hop called “Primitive Sounds” twice a month at a club called River Gods in Cambridge, MA. We have a lot of fun doing that, and the night has led to other things, including another regular night at Brass Union in Somerville, MA. We’ve been doing this new night for about a year, and we’re simply calling that one “Easy Ed and P.J. Eastman Spin the Platters.” Our next one is December 9. (Info here.) You can find us at Brass Union once a month on the second Wednesday. Here’s next week’s flier, and the promo blurb. A holiday happening? A red-hot record hop? Primitive Sounds in Exile? Whatever you call it, the records will be hot, the crowd cool, the drinks tall and bubbly, and the food delicious. Join Easy Ed and P.J. 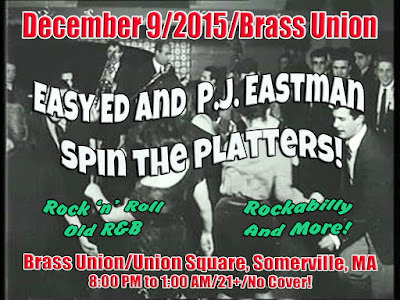 Eastman December 9 at Brass Union for their monthly Somerville record party. 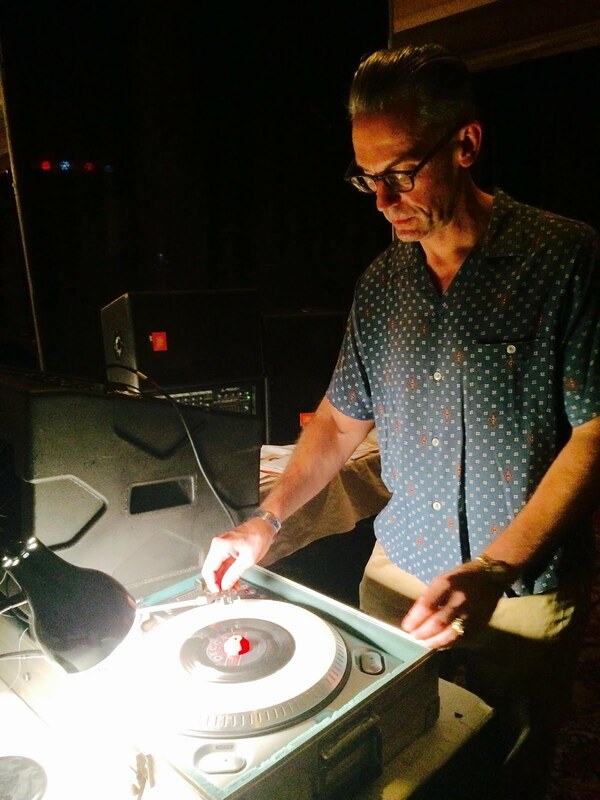 They'll be spinning their finest rock 'n' roll, R&B, rockabilly, and more just for your. Brass Union is cool nightspot with a fantastic sound system, great food and drink, friendly staff and patrons, table games, dance floor, and more! They've got it all. See you there! Brass Union is located at 70 Union Square in Somerville, MA 02143. 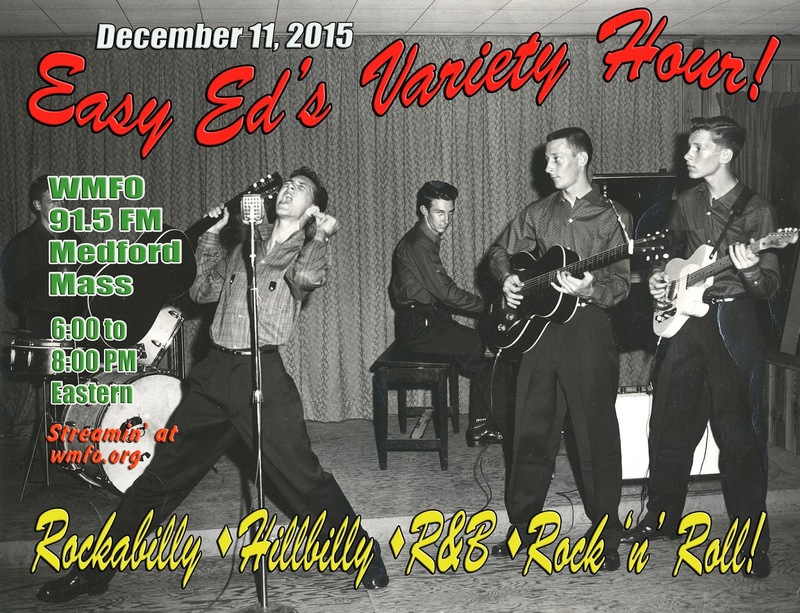 The next edition of the “Easy Ed’s VarietyHour” radio show will happen on December 11. More about that next week, but I hope you can tune in (or download the podcast after the fact). 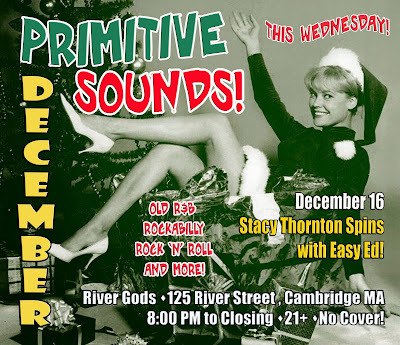 On December 16 I'll be back at River Gods, spinning the Primitive Sounds with special guest DJ Stacy Thornton. Details here! 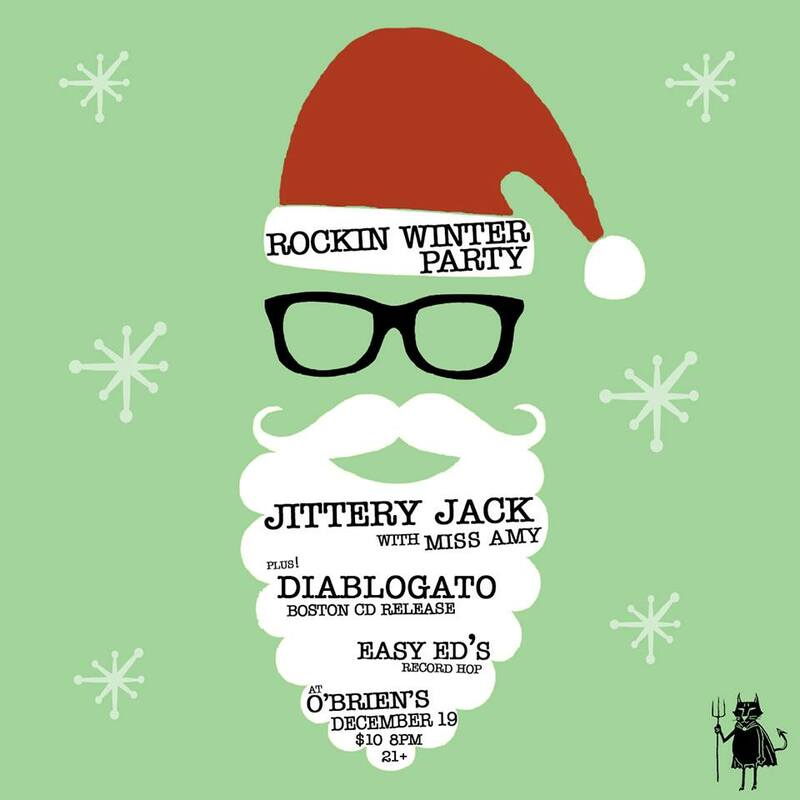 On December 19 we’ve got a huge rockin’show planned at O'Brien's (3 Harvard Ave., Allston, MA) with Jittery Jack, Diablogato, and Easy Ed’s Record Hop. Hope to see you before the snow flies!